Artichokes – What are they? An artichoke can be either an annual or a perennial plant depending on the variety of plant you are growing. The perennial Globe Artichoke's botanical name is Cynara scolymus. An artichoke plant when fully mature can grow to cover an area of around two metres in diameter and can reach a height of about a metre and a half. If you do not have much space in your garden then it is a wise idea to only germinate one or two seeds otherwise you will have to discard some of them when its time to plant them in your garden. Artichokes have long, arching lobed leaves which are silver-green in colour and look like a giant fern. If allowed to flower artichokes give rise to purple-violet flowers which can grow up to18 centimetres in diameter. If you are planting artichokes to eat you will not want the plant to flower as you want to harvest the bud before it flowers. 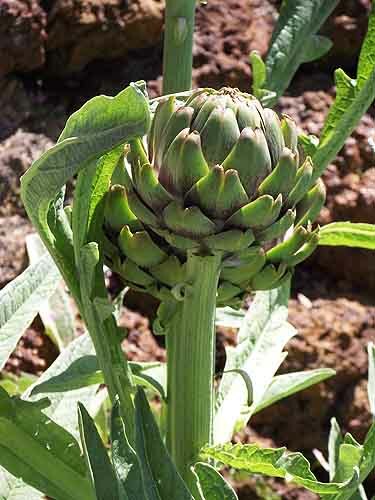 Artichokes if grown in ideal conditions can produce between 40 and 50 buds per plant per annum. How to plant and grow artichokes. There are three ways of growing artichoke plants and these ways are set out below. Artichokes plants are easy to grow from seed. As they grow pretty easily not all seedlings will be genetically true to the parent plant the seeds came from so it will be necessary to plant a few more seeds than the number of plants you want to plant in your garden. Once the seeds germinate you can remove any seedlings that look different from the others and discard them. Most gardeners who plant artichoke seeds grow them in a greenhouse or a well lit warm room on a window sill. The time to plant them in South Africa is late August early September (early spring) when the weather starts warming up. For seedlings, use a good soil based potting soil mixed with a soil based compost to plant your seeds in. Place seeds and soil into containers or pots of about 10 centimetres in diameter. One or two seeds per pot and then weed out the weakest seedling once they germinate. Seeds take about 2-3 weeks to germinate. Keep soil moist, don't over water but also do not allow soil to dry out. Once the seedlings are ready to be planted out they should be planted in a rich, deep, free-draining loam or sandy loam soil. Before planting turn the soil over soil to a depth of about 60 centimetres and work in plenty of compost and manure. Artichokes need excellent drainage, and loamy or sandy loamy soils are ideal. Artichoke seedlings also need plenty of nutrients to develop, so you should feed them with a good quality liquid plant fertiliser once a week. When transplanting your plants into the ground prepare your soil by adding one cup of organic fertilizer or a shovel of compost or aged chicken manure into the ground just before planting. You can also apply 1/2 cup of bone meal or super phosphate for each plant. If you don't want to plant your artichokes directly into the ground prepare raised beds using the same soil mixture as set out above. Artichoke seedlings are ready to be planted out once the soil outside has warmed up and there is no frost about. Seedlings should be about 15- 20 centimetres in height or about 8 to 10 weeks old before they are ready to be planted out. If the seedlings have been grown inside they should be put outside in a semi protected area for 2-3 weeks to allow them to become acclimatised to being outside before actually planting them in their final garden spot. When planting place your artichoke seedlings in a sheltered position in your garden where they receive full sun for most of the day. If your garden is very hot artichokes should be planted in a position where they get afternoon shade. Plants should be planted about one and a half metres apart as they get very large when mature. To plant shoots from existing plants you either need a growing artichoke plant in your garden or a neighbour or friend who has one growing in their garden. Mature plants put out shoots around their base and all you need to do is take a spade and place it between the adult plant and the shoot and sever it from the main plant. Ensure that you go down deep enough to keep the shoot's roots entact. Once you have harvested the shoot plant it in your garden using the method set out above. Dormant artichoke roots are obtainable at some nurseries. They should be planted in early spring as set out above. Keep the planting bed moist, and water the plants well as they grow. Artichokes will grow new shoots every year. To ensure that your artichoke buds remain tasty tender and large remove all except two of the strongest shoots every year. 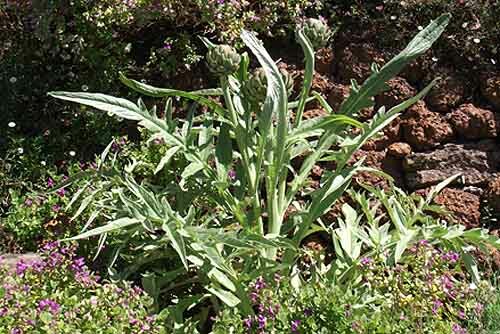 Artichokes being perennials will continue growing and flowering for at least six years. After three or four years the heads or buds get smaller and tougher so it is a good idea to dig out and throw away some of your older plants and replace them with new plants. To keep your existing plants healthy, each year, in early spring add a good helping of manure and compost around the base of the plant. Keep the plant well watered at all times. If you live in an area where you experience frost in winter it will be necessary to provide the plant with some protection. To do this cover the plant with straw. As you can see growing artichokes is pretty simple.